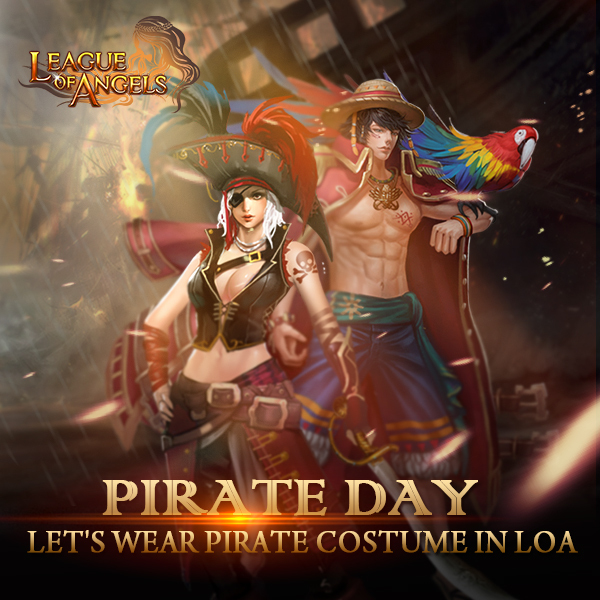 North America Forum»Forum ›League of Angels ›News and Announceme... › Pirate Day Celebration! September 19th (every year) is International Talk Like A Pirate Day. LoA will issue a special event in game in hot events! Don\'t forget to check it out! You\'re welcome to share the way how you celebrate this special day here. Let\'s see who have enjoyed the most interesting moment. Hope you enjoy the day in LoA! International Talk Like A Pirate Day is a parody holiday annually held on September 19. Celebrated for the first time in 1995, the fun holiday encourages people to talk and dress like the sea plunderers of yesteryears. Dress up like a swashbuckling pirate. Bonus points if you are able to carry a parrot or a monkey on your shoulder. Talk like a pirate the whole day long. Intersperse your speech with grunts and growls and slur your words. Call your friends “matey” and intentionally use bad grammar. Host a pirate themed party and ask your guests to come dressed as pirates. Watch movies and read books that feature pirates as central characters. Some examples include the Pirates of the Caribbean film series and Treasure Island by Robert Louis Stevenson. its a navigation king or theme event ? 2019-4-21 14:59 GMT+8 , Processed in 0.058271 second(s), 52 queries .